Surely, you are all familiar with the concept. If you aren't just watch a few episodes of My Name is Earl. I'll be waiting here while you get up to speed. This, my friends, is a story about karma. It's a story about what happens when you go to get water from your office water cooler, only to discover that the bottle is empty. And you then proceed to ignore the empty bottle, hoping that someone with a bit more upper body strength will notice the lack of water and change the bottle. You know what happens when you act like you never saw the empty bottle? You go back for water the next day, and it's still empty. And you're wearing a white shirt, which is bad, because those ridiculously heavy jugs are sitting on the nasty, nasty floor. And, despite your best efforts, not only do you get some of that funk on your clothes, you also manage to splash water all over the back wall of the breakroom, and some on yourself. And you're really glad there aren't any cameras back there, because then someone would see you trying to lift one leg up to perch on the nearby shelf, so that you can rest that dirty, heavy, splashing jug on your knee and get a better grip. And they would see that your legs are just too dang short, and won't reach the shelf, and that you have to wait for at least 1/3 of the water to splash into the cooler before that bottle is light enough for you to hoist in the hole. And what is your reward for all that hard work? Room temperature water, because the reservoir was empty and there hasn't been any water in there getting cold. Because you didn't refill the cooler yesterday, when you first noticed it was empty. Especially since a girl I went to college with set us up with a networking site, and I'm totally addicted now, and folks are starting to visit here. The site is great - I really miss all the folks I knew back then. Since Jason and I moved so far away, we never have any contact with them. And then I Googled my friend Rachel (Hi Rach! ), who still lives in that area, last weekend, and well, the rest is history. Our 10-year reunion is this year (usually graduation weekend) but I'm not going to be able to go, what with the 500 mile distance and the rising crude oil prices and all. I loved college. LOVED it. The college we attended was small - just a couple thousand students total - and that helped everyone get to know one another better. Sure, I had some awful experiences. Everyone does. But if I could pick one time in my life to go back to, I think that would be it. I have such great memories - driving 45 minutes to get to the dollar movie, Burger King Whopper runs just before curfew for a 99 cent burger and an ice water, the Arby's value menu (with the added bonus that with a student ID we got our drink free if we bought two things! ), hanging out at the EC Cafe with Jason and our friends. We were so far out in the sticks, we did some pretty odd things for fun. One night, a group of us loaded up in Jason's two-door Sentra and drove what should've been about an hour to see a big outdoor Christmas lights display. Except we got lost, and drove around in the dark Georgia night for many, many more hours. And Jason let his roommate Ron drive, and Ron kept turning off the headlights and driving in the dark. And then we stopped for gas, and went through the car wash, and as the dryers were coming around Ron rolled his window down and laughed maniacally into the force of the hot air. Even if gas wasn't an issue, I couldn't go to graduation weekend because of scheduling conflicts - this year, it's on the Saturday before Mother's Day, and that's the day of our big Mayfair here in town and I have to work covering it. But now, thanks to Brianne, we have a way to reconnect. It's like a reunion, except I don't have to leave my seat! Brilliant! What in the world did we ever do before the internet? Being a parent, it's hard work, y'all. Especially once your kid gets to school, and you have to deal with the whole bureaucracy there. One of the kindergarten teacher aides from Anna Marie's school comes to my Weight Watchers meeting. And while we weigh in, we sometimes chat about how school is going. And lately she's been telling me that a couple of the teachers had nixed the idea of taking the kids on their annual zoo trip. Now, I know the class sizes are bigger than usual this year - each class has 27 kids! That's due to two factors - one, we're experiencing tremendous population growth, and two, one of the teachers retired last year and they never hired a replacement. Twenty seven kids might not sound like a lot, but oh my word, it is! So, this past Thursday at weigh-in, this teacher aide tells me that the trip is off - and that Little AM's teacher is one of the ones who doesn't want to go! Keep in mind, our teacher also has a daughter in kindergarten at the school, so she's cheating her own kid out of the trip. One of the excuses the aide said she was told (and there was another kindergarten mom in line with us, talking) was that there weren't enough parents willing to help out. Hello! We haven't even been told a date for the trip! No one asked us to help! So Friday, I sent an email to the principal. He finally responded this morning, saying that those decisions were made at the grade level, but that he had spoken with the teachers, and the trip was back on. I don't want to take credit for this - I know I can't be the only parent who heard the trip was canceled and went to the administration! And part of me is a little worried that AM's teacher (remember, the one who wanted the trip canceled) would get wind that I had contacted the principal and give The Kid some problems. I certainly don't want her last month of kindergarten to be ruined because of her mom! Now, I have to live up to my end of the bargain - the principal said that I needed to get as many of the parents as possible to come chaperon. I don't know many of the other parents from her class (because, oddly enough, when I go volunteer for something they aren't there!) but I do know the class mom, so I guess I'll have to enlist her help with the contact information. And I also may have to get Jason and both my parents to sign up to go. But man - what do other kids do, when they have parents who either don't care enough to get involved or are not educated on how to do so? How are we supposed to get the best education for our kids, if we just sit back and take what's handed to us instead of taking a pro-active approach? It may just be a trip to the zoo, but I think it's the principle of the thing - they had us order class T-shirts in the fall, and specifically said in the note that they would be worn on field trips, to include the annual zoo outing. I don't think I'm remiss in saying that the two trips they've had so far this year, both of them to the movies, do not count as actual educational experiences. Guess I'd better buckle down and get to dialing now, huh? You know how those "celebrities" are always being hospitalized for "exhaustion?" Not that I (one of The Uninsured) wish to be hospitalized, but you know, a day off would be nice! Or, at the least, a full night's sleep. I'm having a hard time even typing this, because I've gotten about 10 hours sleep in the last two days and my hands are shaking! Yesterday, I woke up at 2:45 a.m. and it took me over two hours to get back to sleep. When I finally did, it was nearly 10 before I woke back up. You'd think that would be enough to cure this problem, but I think the sleep deprivation is becoming cumulative. After I did wake up, we went over to my mom's house and - oh my gracious, I can't believe this still - we drove to Oxford (45 minutes away) and bought two kiosks. Oh, yes we did. The kind you see in the mall, with the wheels on the bottom and the canopies on top. Literally that kind, because they came from a mall that's shutting down for renovations. And I'll say it again - oh, yes we did. They're for the catering company, because it looks as if Peasnap's will officially be taking over operations of the auction kitchen come July. 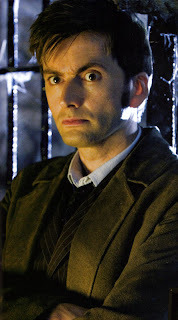 And let me just say - I'm pretty terrified at the prospect. Even though in the last three days I've twice heard the "be anxious for nothing" scripture, still, I'm the only one in this family-run business with a non-auction paycheck, and I don't like uncertainty! So now, we (the catering company, I mean) are the proud owners of two mall kiosks. The fun part will be figuring out how to get them back up here, and where to store them once we get them. They're destined for the auction bay, where we'll use them to sell hot dogs to the dealers so they won't have to leave the lanes to eat. There used to be an actual concession stand in the bay, but one of the former managers took it out, for reasons apparently known only to him. Maybe this whole auction thing will work out better - there is a chance that Jason could open the cafeteria on non-sale days and increase food sales somewhat. With gas pushing $3.50 a gallon, though, it would have to be pretty substantial to warrant the 20 mile trip in my estimation. And now, gentle readers, my stomach is growling. I've had my two cups of coffee, and now I have to figure out what to eat for breakfast since I'm out of my old standby nonfat yogurt with berries. Because the day has just begun, and already I'm exhausted. 152. Up a pound for last week, but it's "one of those weeks." If you know what I mean. And I think that you do. When last we spoke, Jason's nephew was just diagnosed with a set of fused kidneys. Thanks for all your well wishes - and your suggestions. Jason hasn't spoken with his mother, so we don't know how the kiddo is doing. My GM came up with the (wonderful! great! stupendous!) idea for us to produce a special section in honor of the Mayfair festival that our town throws each year, the Saturday before Mother's Day. I spent big chunks of time working on it Tuesday, and then all day yesterday - only to find out at 4:30 that I'd left out a couple of articles! I got them put in, but had to leave to get Anna Marie from dance, fix dinner for the two of us, and get us to church. Ergo, I had to return to the office at 9 p.m. last night to finish sending my pages to the press. Oh, and then this morning - I somehow oversleep by 15 minutes, even though my alarm apparently started going off on time! How'd that happen? I'd like to know! I get to work, and sit down to start on today's page, and the computer won't let me save any pages. The hard drive was full! Huh? You mean that server hard drive isn't infinite? It only has 72 gigs of space? And I can't expect that my 2,200 pictures backed up, along with six months of pages, can't live there with everyone else's stuff? For the record - the page editor is supposed to clean out her news folders every week or two. There was stuff on that server from before she got there, oh, a year ago. When Amber started cleaning her folders, we immediately jumped up to 14 gigs! And, when the computer system was purchased, only three of us had data on the server. Since then, the server that was being used by the classified department died and instead of buying another one, that information was moved to our computer. I spent nearly three hours this morning cleaning my stuff off the server. Fortunately, I'd nearly finished writing my feature story for today so I didn't have much work to do. The best part of this week though - I found out yesterday that I'm going to Biloxi for the press convention this summer! Time to go bathing suit shopping! Whee! Of a whole week ago! I would've done this post sooner, but the pictures were on my new phone, and I don't have a memory card for it yet, so I have to use the software and a USB cable to get them off, and I can only do that at home, and I'm just not home all that much. 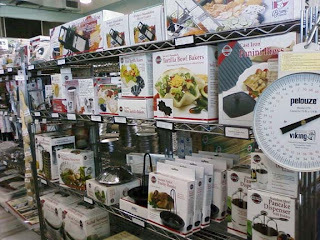 A fabulous kitchen supply store called Lit! 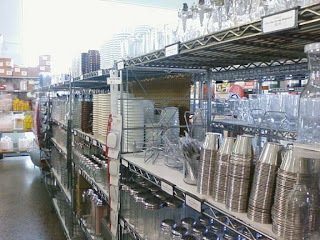 And, in the back, they have bulk items like plates and flatware. We got some stuff for the auction kitchen, and for us a couple of new whisks and a stainless steel container we're using to store our cooking utensils on the stove. Oh, and for Amanda, a cake knife like a real, live chef would use. She's legit now, y'all! In case you can't read that signage, it's called the "New York SUIT Exchange!" Isn't that a clever name for a clothing store? Jason bought the suit he wore to his sister's wedding there last year, because they usually have a great deal going: buy a suit (of surprisingly good quality) for $100, and they throw in a shirt, a tie, a belt, and a pair of socks FOR FREE. He also got a nice pair of shoes for an extra $33. And sometimes, if you spend $200 on a suit, they throw in three shirts, three ties, and three belts. I don't know how they do it, but it sure was the deal we were looking for last summer. 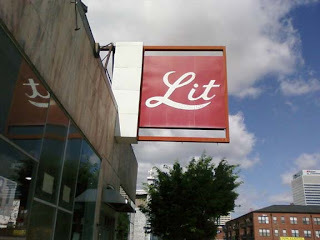 We had to get to Lit pretty early, because they close at noon on Saturdays. We stopped at Abners on the way home - now officially my favorite chicken finger place. Grilled, y'all! They have grilled chicken fingers! And baked potatoes! The best baked potato I think I've ever eaten! Today, we aren't so much into excellent adventures - unless you count me walking 10 minutes to the grocery store to pick up a couple of things so I could get more exercise and conserve gas. Today we're more into doing some stuff around the house - Jason and Anna Marie are outside doing yard work, and when she comes in we're finally going to use the cookie baking set my mother got her for Valentines's Day. 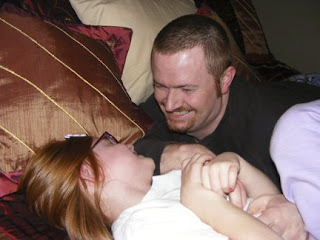 Bonding with the SciFi geek I've been married to for nearly 10 years now over the new season of Dr. Who. How could you take a perfectly good book - nay, a great book, and butcher it so completely? When I heard you'd made a movie of The Memory Keeper's Daughter, I was so excited! I ran into my office and told Cathy, who was listening to the book on CD at the same time I was reading it. We finished about the same time, and she was excited too. I recorded it Saturday night, but waited an extra two days - two days - to make sure I had ample time to watch it uninterrupted. Man, I don't know if Cathy saw your movie, but I bet if she did, she's as disappointed as I am. Shame on you! I understand having to condense things - I did sit through all three installments of The Lord of the Rings - but really, you just started making stuff up there after a while. And - and! Leaving out some very pivitol plot points to boot. The ending? You took it from a bittersweet moment to a full-on sapfest. Oh, Lifetime. I expect so much more from a group of folks who loves The Golden Girls nearly as much as I do. I hope you've learned your lesson this time. Don't let me catch you doing this again. I was so tired I almost forgot to post this. Almost! Remember a couple weeks ago when I gained 1.5 lbs.? Guess what? I lost that 1.5 this week. My weight is like a roller coaster, baby baby! Yeah...I've got mad singing skillz too! And by "this" I mean "showing what a huge Sci-Fi geek my husband has transformed me into in just 10 short years." I don't want to talk about how I had to work until 9 p.m., and the internet on my new phone wasn't working so I couldn't check the score while irate parents argued with school district officials about a new building for their farm education program. I don't want to talk about how elated I was when I got to the parking lot and one of the other folks leaving the meeting called a family member to get the score, and that score was tied. I don't want to talk about how I got in bed and (because Jason opted to sleep on the couch and not keep me up with his inability to sleep) kept changing the channel back and forth because I was too nervous to just sit and watch the game already. I don't want to talk about that last second, when I happened to be watching and it looked like we were going to win, and someone from The Other Team sunk a three-point shot just as the buzzer sounded to tie the game and send it into overtime. And I really, really don't want to talk about how I kept turning off the TV, only to lie in bed for a few more minutes and, unable to sleep turn it back on - just to see that they were talking to a coach, and it wasn't Coach Cal, and those guys wearing the championship caps didn't look thuggish enough to be from our team. Like I said, I really don't want to talk about it. With apologies to Ice Cube, of course. Especially since I really didn't have to use my AK. Ever have one of those days that when you wake up, you have no idea what the day holds? It started out VERY good, as I slept until 10 a.m. That's a very good start to any day that I don't have somewhere scheduled to be! Anna Marie was at mom's which is a pity for mom, because my little red head didn't afford her the same luxury. Her internal clock still woke her up at the appointed time to get to school - pre-7 a.m.
That's what grandparents are there for, folks. Taking the lumps to give us a break. Anyway - I skipped the coffee, since at 10 a.m. I wasn't really struggling to get moving, but I was just sitting down to my yogurt and strawberries when the phone rang. It was my mom, saying they were going to the next county over to a free museum, and they really wanted us to come. Now, Jason was already dressed, but I had to take a shower. I asked her to give me 20 minutes. I ate my breakfast while I gathered my things, and I was ready before they got here. Tunica was quaint. Well, the parts that haven't been overtaken by the casinos, that is. We ate at a diner that used to be a gas station. I had a vegetable plate - you know, three sides. This, while I watched the rest of my family scarf down hamburgers and onion rings. After the museum, we came back home. Did I tell you that Jason has been waiting with bated breath to upgrade our cell phones? I'd be surprised if I didn't, because that's mostly all he's been talking about for weeks now. Our upgrade date was supposed to be today (Sunday), but when we got home yesterday he got on the ole WWW to check. Walmart had a deal to get them for $48 each. Now, you may wonder what in the world I'm doing with a smartphone. I'm wondering that myself. 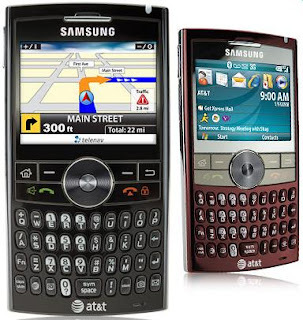 But it has a qwerty keyboard, so it should make my texting habit that much more bearable. Except, the Walmart we went to didn't have them. So we drove another 15 miles and found one that did. (Except - no red ones! Boo!) But guess what - no SIM cards! How do you send a store a bunch of phones and only a handful of the cards that make them work? The nice girl at the counter advised us to go to the ATT store nearby and buy the cards (at $26 a pop?) and come back to buy the phones from her. But never fear - when we got to the store, my courageous husband convinced a nice young man named Tremaine to price match Walmart's price! So we got the phones for half of what the store wanted! And we didn't have to buy the SIM cards! Which saved us another $50! The atmosphere in the store was one of great unity, because - the clerks were all wearing the colors of the University of Memphis. Go Tigers Go! (That's the name of their fight song, for those of you who didn't grow up in the Mid South.) We were in the store during the game, and one of the managers kept checking the score on his iPhone. Man, were we all ever excited! But not nearly as excited as when I checked the score later, and found out they'd won! Who'd have thought a bunch of thugs (because really, most of these guys have rap sheets) from little ole' Memphis could get this far? No offense to any Kansas fans out there, but we're going to win tomorrow night. I'm just sayin'. Oh, and did I mention that I went to the grocery store, and thanks to some coupons from my mom and some help from my new best friend, The Grocery Game, saved 64% on my bill? That, my friends, makes it a really, REALLY good day. To sum up: sleeping in, museum, Blackjack II, big grocery savings, and Memphis in the finals. Yep. And I don't even need to see a blimp scrolling the words "Melissa's a pimp." May as well get this over with. I gained back the 1.5 lbs. I lost last week, taking me back up to 153.5. Oh, well. You lose some, you gain some, right? For now, I'm just keepin' on keepin' on. Note: no Tickle Monsters were harmed during the making of this blog post.